Lower Real Estate Commissions. Others will say… if you pay less, you get less. Realty! See the Truth here! Exceptional Service and Saved Tons of Money in the process. The Proof… Abundance of 5-Star Reviews! that has left a Plethora of Sold Homes and Satisfied Clients in it’s wake. “That is our story” Ken Carroll would say. “Our Past Clients tell our Story. It Done! 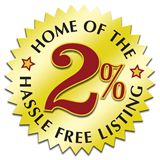 Try us Risk-Free with our 2% Hassle-Free Listing Agreement. Thank you for visiting our website! Please consider it as your online source for local real estate information and return often for the latest property listing updates.